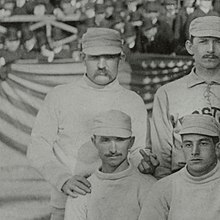 As a starting pitcher for the Providence Grays (1881–1885), Boston Beaneaters (1886–1889), Boston Reds (1890), and Cincinnati Reds (1891), Radbourn compiled a 309–194 career record. In 1884 he won the National League's pitching Triple Crown with a 1.38 earned run average, 59 wins and 441 strikeouts. His 59 wins in a season is a record which is expected never to be broken because no starter has made even as many as 37 starts in a season since Greg Maddux in 1991. Also, his ​678 2⁄3 innings pitched in 1884 stands at second all-time, behind only Will White (680 in 1879), for a single-season. It, too, is a record that will most likely never be touched. It was made possible by the mid-season expulsion of the Grays' other main pitcher, Charlie Sweeney. There is a discrepancy in Radbourn's victory total in 1884. The classic MacMillan Baseball Encyclopedia, as well as the current Sporting News Baseball Record Book both credit Radbourn with 60 wins (against 12 losses), as does his National Baseball Hall of Fame biography. Other sources, including the Baseball Reference and Baseball Almanac links shown here, give Radbourn 59 wins. Some older sources (such as his tombstone plaque) counted as high as 62.